The update experience of the person who made this Youtube video is probably quite typical for other African Americans as well. Her main African region before the update was 21% “Nigeria” After the update only 2% remained. Understandably she assumes that Ancestry’s update has lead to greater accuracy. After all Ancestry’s samples have been increased from 3,000 to 16,000, right? However based on my evaluation in this blogseries I’d say it’s very likely that she’s still part of the Naija club! The title of this blogseries was sort of meant to be tongue-in-cheek 😉 . However ultimately I do not see much benefit in taking a demoralizing stance. I do still believe that Ancestry offers opportunities for those wanting to learn more about their African ancestry. As always however it is essential to be fully informed about both strengths and weaknesses for each separate aspect of DNA testing. This particular update by Ancestry has arguably been a failed one for people of African descent. But this does not mean that improvement may still be forthcoming, if not on Ancestry than elsewhere! I am specifically referring to admixture analysis a.k.a. ethnicity estimates. As my previous AncestryDNA survey findings have demonstrated that potentially this tool can be very useful in unlocking the secrets of main African regional lineage for Afro-Diasporans. In this final part of this blog series I will try to outline some promising developments, both on Ancestry and elsewhere, when wanting to Trace African Roots. I will also look into some common reactions & frequently asked questions about this disheartening update for Afro-Diasporans & Africans. Providing my own perspective. 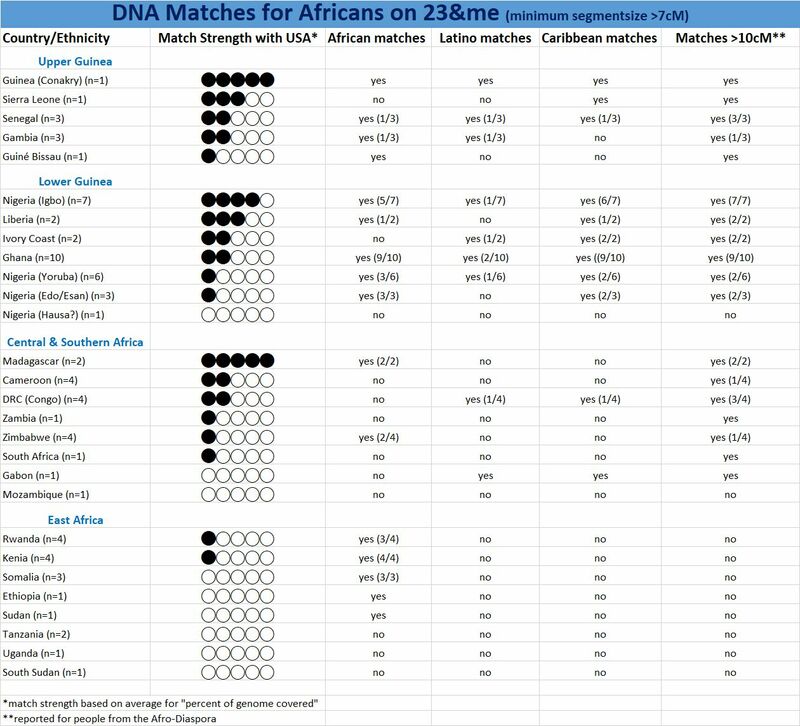 My main advice for achieving optimal insight in regards to your African breakdown can be summed up as follows: stick with your previous AncestryDNA results and combine with follow-up research (DNA matches, genealogy, relevant historical context, other types of DNA testing, etc.). Source: Ancestry’s White Paper 2018. Text in red added by myself. Compare also with this overview of Ancestry’s previous Reference Panel. 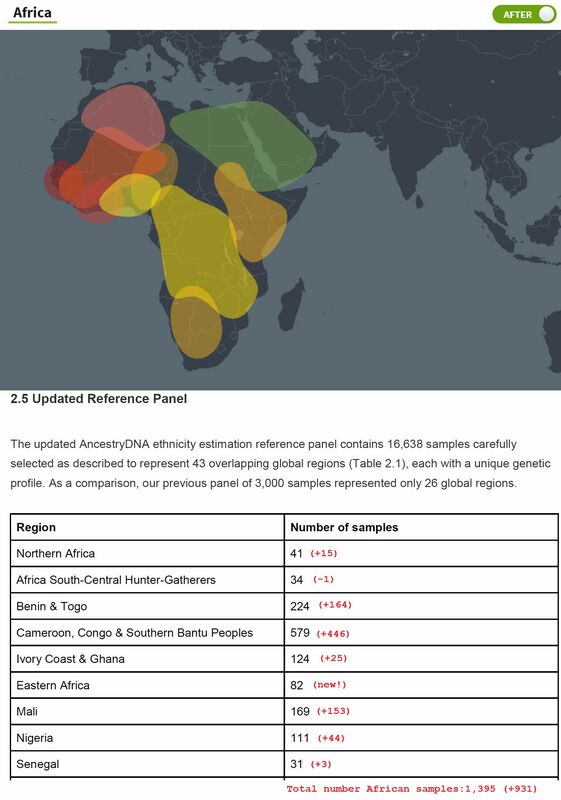 The number of African samples included in Ancestry’s Reference Panel has increased considerably. However take note that this increase of African samples has been disproportionate. Mostly benefiting the “Benin/Togo”, “Mali” and “Cameroon, Congo & Southern Bantu people” regions. The title of this blog series was sort of meant to be tongue-in-cheek 😉 as I do believe that Ancestry still offers opportunities for those wanting to learn more about their African lineage. Nonetheless it seems very clear to me that Ancestry’s update may indeed have “killed it“, but only with their new Asian & European breakdowns! However not so with their African breakdown which has taken a big step backwards instead of forwards. At least in most aspects. More is not always better: over-sampling for “Cameroon, Congo & Southern Bantu”, “Benin/Togo” and “Mali” causing inflated scores? 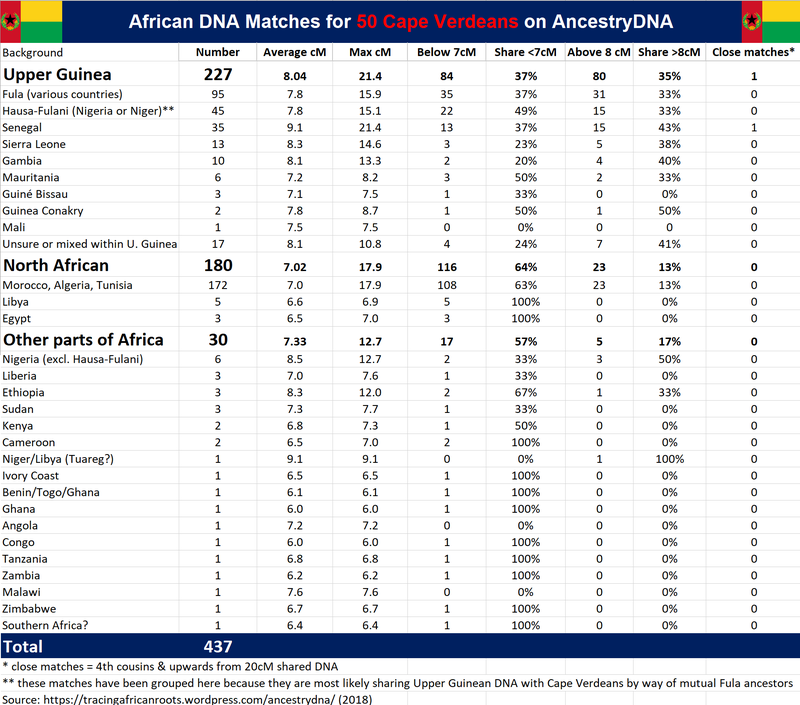 What are the ethnic backgrounds of Ancestry’s African samples? New algorithm has issues with describing mixed/complex lineage? Last week Ancestry finally rolled out the updated version of its Ethnicity Estimates for all its customers. Sadly the concerns I raised in July have become reality. 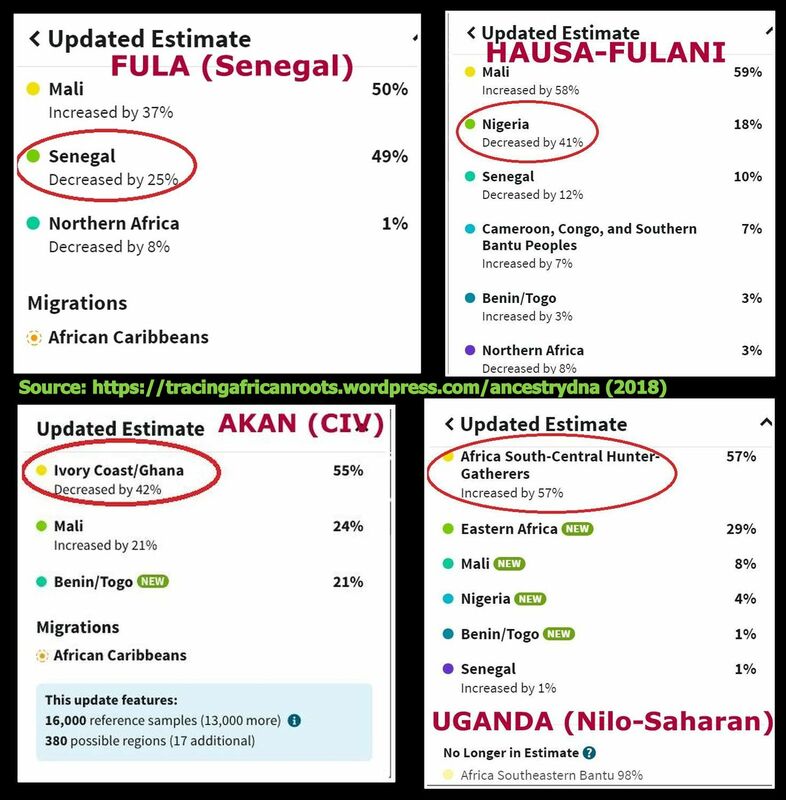 Many people are now left confused by their revised African breakdown as reported by AncestryDNA.1 Understandably so given the often drastic and seemingly incoherent changes compared with the previous set-up. 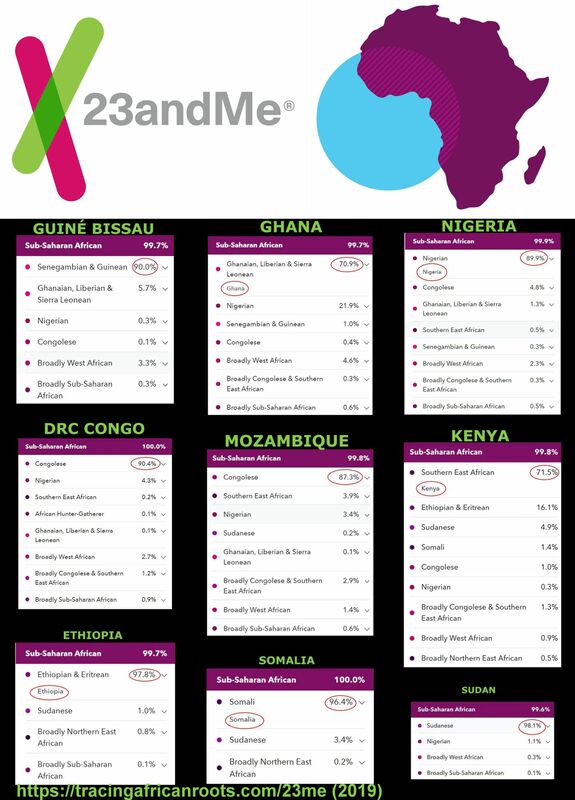 In this three-part blog post I will argue that Ancestry’s pioneering analysis of especially West African DNA has been downgraded rather than upgraded! I am a guy who prefers to see the glass as half full rather than half empty. Which is why I have been surveying AncestryDNA results for so long despite imperfections. After all when Tracing African Roots most people do not have the luxury to be snobbish about admixture analysis. Instead they will want to maximize informational value from any promising source available, again despite shortcomings. Combining research findings in order to achieve complementarity rather than putting all your eggs in just one basket. But right now after this long awaited update my main feeling is that Ancestry has simply broken the glass 😉 . At least in regards to their African “Ethnicity Estimates“. I find it very regrettable to say that currently I do not see much added value in Ancestry’s updated African breakdown and I will not be surveying it any longer. Nonetheless in this three-part blog series I will attempt to point out some redeeming features as well. As I do still also believe that being overly dismissive may deprive you of valuable insights yet to be gained. 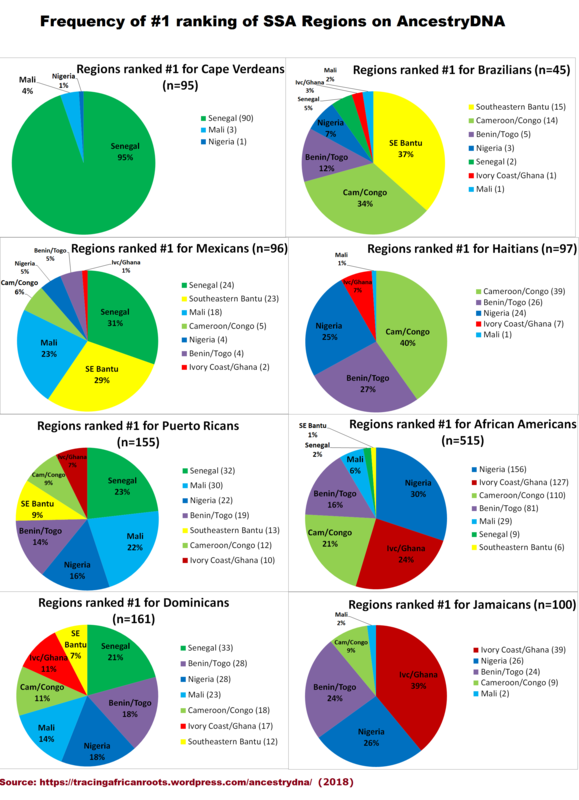 In previous blog posts I have demonstrated how the current African breakdown on AncestryDNA can be very insightful to gain a greater understanding of the regional African roots for people across the Afro-Diaspora as well as actual Africans themselves. Despite several shortcomings as well as the continued need for correct interpretation. My survey findings on a group level have still been reasonably in line with either historical plausibility or actual verifiable genealogy. A new version of AncestryDNA’s Ethnicity Estimates has been provided gradually (and quietly..) to a subset of Ancestry’s customers for at least since April 2018. I do not have all the needed information in place yet to make a proper assessment. Therefore I reserve my final judgment on this intended update for later. However in this blog post I will discuss some suggestions on how to improve on the current African breakdown hopefully ensuring that Ancestry’s update will be a step forward and not a step backwards. Below a short summary of these suggestions. If you continue reading I will provide more details. Add more historically relevant African samples to Ancestry’s Reference Panel. In particular from Angola, Burkina Faso, Guinea Bissau/Conakry, Liberia, Madagascar, Mozambique and Sierra Leone. Create new regions and/or migrations centered around these historically relevant samples. Create new African “migrations”, a.k.a. genetic communities. In particular for Nigeria & Ghana, as sufficient customer samples may already exist. Mention the “aggregate ethnicity estimates” for each migration/genetic community. Show ethnicity/admixture of shared DNA segments with your matches. Avoid misleading labeling of ancestral regions. Providing a false sense of accuracy. Even when these are only individual results this outcome for an actual Nigerian could possibly imply that also for other people of (southern) Nigerian descent Ancestry’s update may lead to a substantial decrease of “Nigeria” amounts. 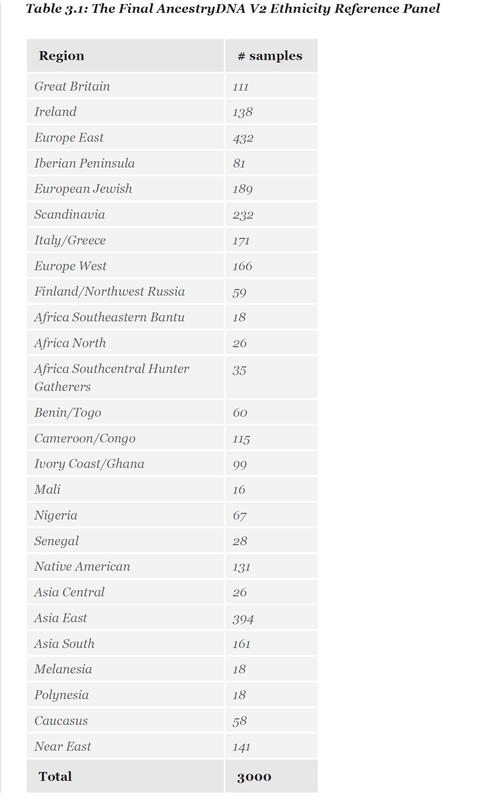 While the “Benin/Togo” as well as the “Cameroon, Congo, and Southern Bantu Peoples” regional scores may drastically increase. Undoing the imperfect yet still reasonably predictive accuracy of the “Nigeria” region in the current set-up. See also: Nigerian AncestryDNA results.